I sell this on eBay for $95 or buy direct for $85 + shipping of $10 within the US or $23 outside. This unit controls the standard transport controls on the Revox B77 & PR99 deck (Play, Record, Stop, Pause, Fast Forward and Rewind). It uses any standard universal remote programmed to control a Sony VCR (preprogrammed universal remote included). Turn off the power to the tape deck. Plug the remote adapter into the remote connector on the top or back of the tape deck. Now power can be turned back on. The light on the front of the remote adapter should be on. The remote adapter does not need any external power. It gets its power from the deck. The remote adapter controls the standard 6 transport functions: Play, Stop, F.F., Rewind, Record and Pause. It can be used with any universal remote programmed for the proper Sony VCR code. On the supplied DirecTV remote REC must be double pressed before Record is activated on the deck. 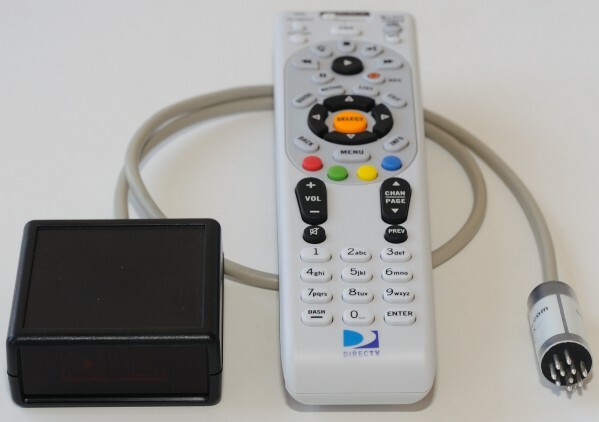 The remote adapter can be programmed to respond to various Sony VCR codes. To select between them there are jumpers inside the unit. Remove the two screws on the bottom of the unit and remove the top cover. Located near the front window is a jumper block with three jumpers. The first two jumpers configure what type of Sony VCR codes the unit will respond to. See the table below for a list of jumper settings. To program the RCA remote press and hold the Code Search button until the red light comes on. Release the Code Search button and momentarily press the VCR button then enter the 3 digit code from the table above (default is 119). The red light should blink after each keypress and go out after the last digit is entered. Press the VCR button and press one of the transport control buttons (PLAY, STOP, FF, REW, REC or PAUSE). The light on the front of the remote adapter should blink off momentarily. If the light does not blink off try reprogramming the remote using the next setting in the table or check the state of the jumper inside the unit and match that to the correct line in the table. 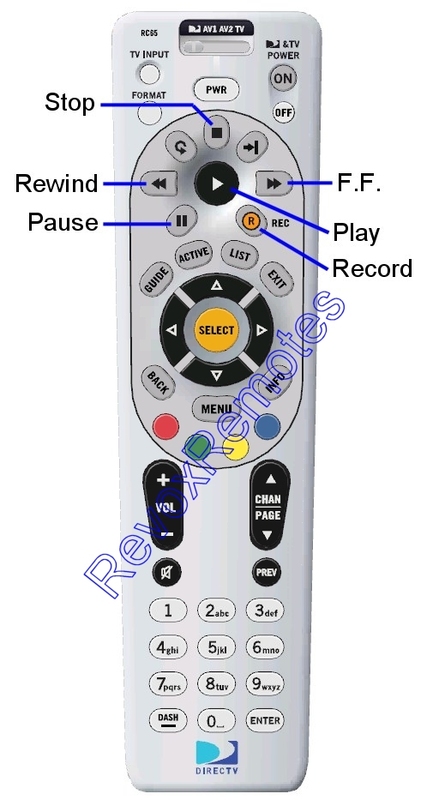 On the RCA remotes the REC button needs to be pressed twice to activate record. To program the DirecTV remote first slide the switch at the top of AV1 or AV2. Press and hold the MUTE and SELECT buttons until the green light at the top blinks twice then release. Using the number keypad enter the 5 digit code from the table above. If done correctly the green light will blink twice after the last digit is entered. Note: On the DirecTVremote the Record button must be double pressed to activate the function. The full manual for the DirecTV remote can be found here. Jumper #3 is used to enable/disable Pause Memory. When not jumpered the Pause Memory feature is enabled. When jumpered the Pause Memory feature is disabled. On some Revox decks, pause is only active when the pause button is held down. This isn't very convenient if you stay in pause for long. When Pause Memory is disabled, the button on the remote must be held down for as long as you want to stay paused. When Pause Memory is enabled you only need to press the Puase button on the remote once to enable and then again to disable. No longer do you need to hold the button down. On the remote receiver the light to the left (the brighter of the two lights) will light as long as the remote adapter is in Pause.